We had the very good luck of a sighting of a short eared owl in the field in front of the house the other day, it was early evening and we had gone for a wander on a hunt for hares. A bird flew past us at some distance but it had the unmistakable body shape of an owl. Fortunately I was able to follow it by eye and it landed on a fence post out in the moss. 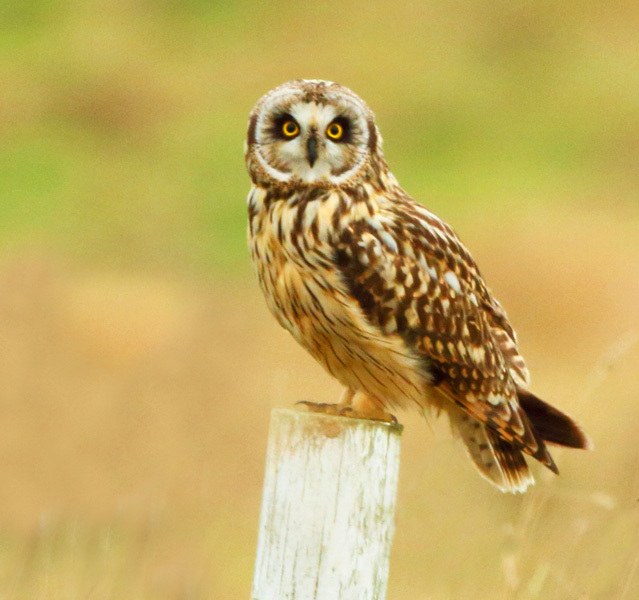 My friend was able to pull it in with her camera and it was easy to identify the short eared owl by its flat face and distinctive facial feathers. After watching the short eared owl for a while and as it showed no signs of taking to flight again we carried on with our wander in the search for Hares. 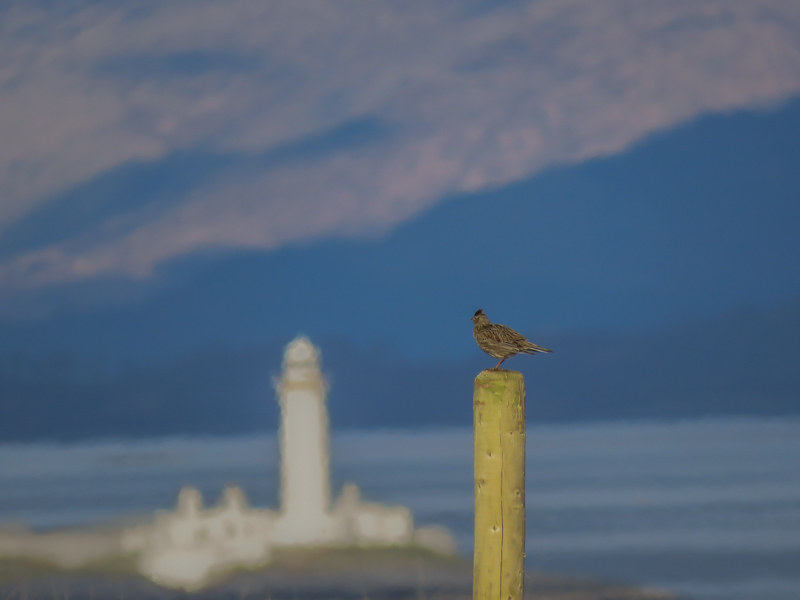 This gave us the second wonderful photo opportunity of a Skylark with Lismore lighthouse in the background, we had watched the Skylarks undulating flight up into the sky singing its heart out and then it glided back down to once again land on a fence post. Using me as a steadying tripod my friend snapped off several photos with the resulting photograph here. 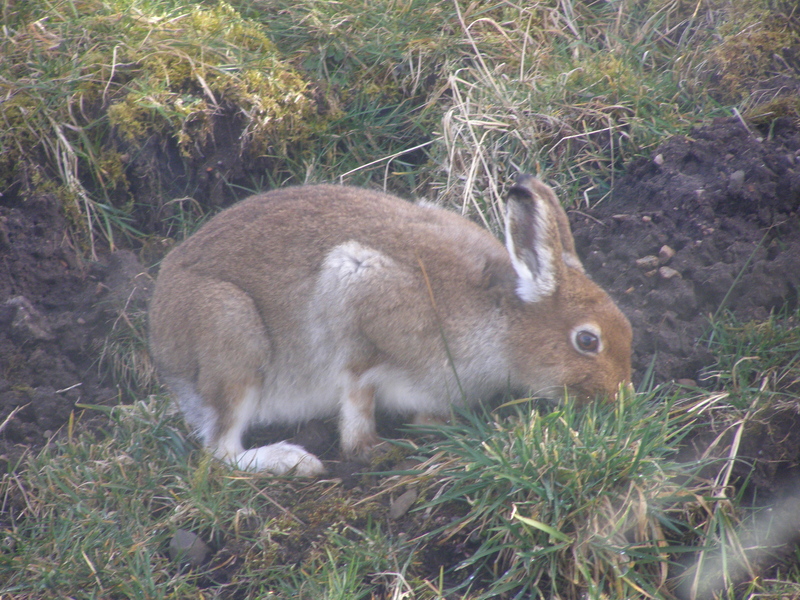 We were to have no luck with Hares that day but the following evening about 6pm I was suddenly aware of movement just outside our fence and there was a hare sitting and grooming itself not 30 metres from the front room window. The Hares haven’t been quite as prevalent in the past few years perhaps that coincides with the arrival of a pair of Sea Eagles across the field towards Duart castle. What hare in it’s right mind would want to be in it’s white winter coat in a green field with not a hint of snow anywhere with resident Sea Eagles in the area? This particular hare just had the remnants of its winters coat down its back legs so wasn’t quite as obvious.